Though they may appear the same, online reviews are not created equal. There is a difference between Merchant, Local and Product reviews that you need to be aware of as a business owner. Understanding this difference allows you to choose a company that offers the most appropriate tools that you can use to harness the power of online reviews for the benefit of your company. In this article, we are going to use the Shopper Approved, a company that offers all the three major types of online reviews, as our example. 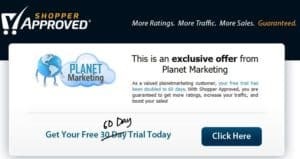 Get a 60 day Free Trial from Shopper Approved today! Should you be interested in signing up with Shopper Approved, the good news is that you can do so at a discount using our link. Not only that, but you also get an unprecedented 60 day free trial in which to try out this amazing online reviews company. So, what are you waiting for? Try out Shopper Approved today by clicking on the banner above! Merchant reviews are the first type of reviews that we are going to look at. This type of review concerns your business as a whole. What have your customers been saying about their overall shopping experience? Why are Merchant Reviews important? Merchant reviews are important inasmuch as they, as we have already stated, are a reflection of your overall standing in the eyes of your customers. The reviews that people leave about a particular company enable their peers to have a better understanding of the kind of experience that they can expect should they choose to also do business with that company. Your customers are asked for feedback immediately after making their purchase. They then receive an email containing a full survey after their product has been delivered. Where Merchant reviews are concerned with your as a seller, along with the overall experience that people get when doing business with your, Product reviews, as the name suggests, are mainly concerned with particular products in your catalogue. Let’s assume, as an example, that you manufacture photographic equipment. A product reviews could cover a specific brand of camera that you manufacture, or any other of your products. How does Shopper Approved Collect Product Reviews? A large chunk of online reviews has to do with visual effects. Just think of how Amazon prominently displays reviews on each product page. This is something that you are able to replicate with the software that you get from Shopper Approved. The reviews that people leave get displayed prominently on your site, thus acting as a magnet, giving people confidence in your products. This visual aspect of online reviews gets even more useful, when it comes to Star Rating extensions. So, what are star rating extensions? Star ratings are a five star based system that is used by Google and other Search Engines to give people an idea of the kind of feedback that your business has been getting from its customers. This is where getting a professional service when it comes to the management of your online reviews begins to bear fruit. Shopper Approved, as an example, is one of the few companies that are licensed by Google to Syndicate star ratings into Product Listing Ads and into Google Shopping. What it means is that should you be using Google Ads to market your product, your advertisements will be shown alongside with the stars that we have just been talking about. This is a useful way through which you can boost your sales. Indeed, Google mentions companies that have star ratings in their PLAs can expect a CTR boost of up to 17%. Local Reviews are the third type of review that your business can expect to find out there. Local reviews are of extreme importance, particularly for localized types of business. This includes restaurants, cafés, bars and other types of small businesses. The importance of local reviews stems from their ability to affect local SEO. 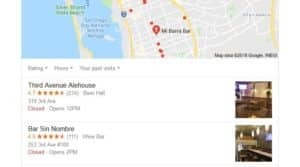 Google, in particular, uses local reviews for local searches. It’s important, therefore, for you to make sure that you are harnessing the power of local reviews to give your business the kind of visibility that it needs within its operating environment. How are local reviews collected? Which type of review should you go for? For your business, each of the types of review that we have mentioned above are of extreme importance. You need to be able to collect merchant reviews, giving your business the kind of overall visibility that it needs in order to achieve growth. You also need to have each of your products reviewed to give your customers confidence in their purchases. Local reviews are also of importance, in that they give your business the kind of visibility that it needs in the area in which it operates.